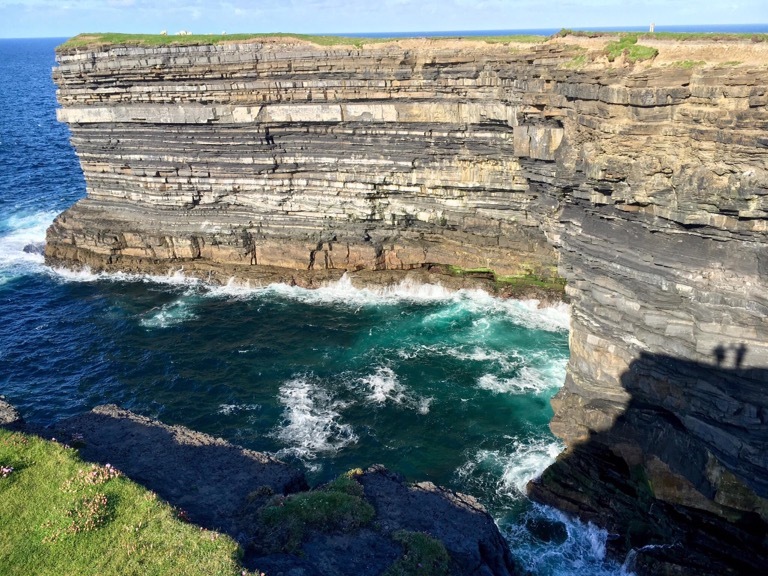 Downpatrick Head, one week ago today. This is my favourite place to go in County Mayo. Our shadows made it even better! Great shot, and you’re right, those shadows of you really make the image! It was a good catch – I didn’t even notice until he pointed us out! Cool – I love it there too! It was perfect there last Wednesday afternoon! Best day ever for bringing American tourists around Mayo. They were well impressed! What glorious colours and textures. I was so enthralled with the rock texture, the swirl of foam and waves, and the gorgeous colors I had to go “What? shadows?” and go back. Somehow the shadows do make a comment – something about humans so small and insignificant by comparison? Yes! Our tiny shout of ‘we are here!’ You have the most impressive description…you should come and see for yourself, if possible.